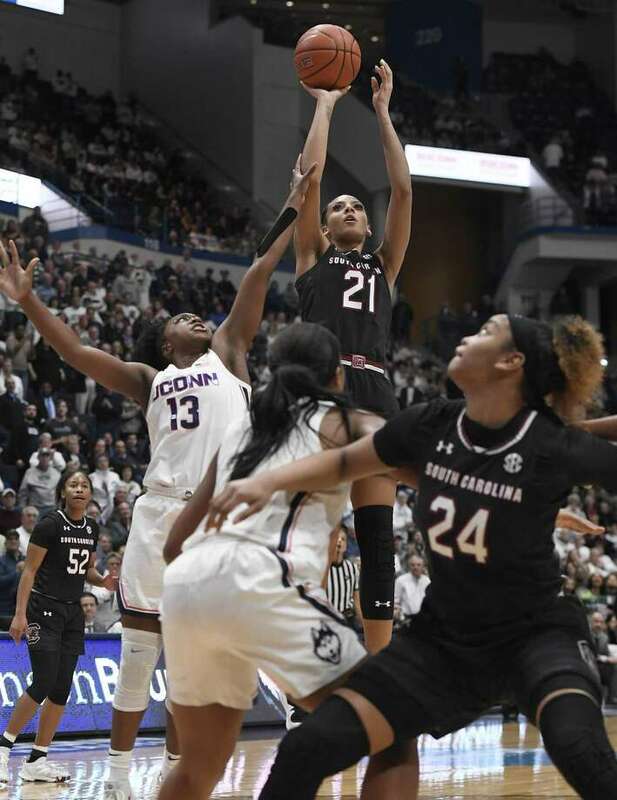 South Carolina’s Mikiah Herbert Harrigan (21) makes a basket as UConn’s Christyn Williams (13) defends during the first half of Monday’s game in Hartford. HARTFORD — It was another statement game, another opportunity for the UConn women to measure themselves against a program with a pedigree of success. The Huskies had received a few other opportunities like this since the calendar flipped to 2019, losing to Baylor and Louisville on the road. But, unlike those tests, this one just happened to be in the comforts of the Huskies’ home building. And they made the most of it. UConn rose to the occasion Monday night, dialing up the intensity in the second half to beat No. 11 South Carolina 97-79 at the XL Center before a crowd of 11,740. “We obviously didn’t feel too good after the Baylor game, we didn’t feel good after the Louisville game,” UConn coach Geno Auriemma said. “Today, not only did we win, which obviously is the goal, I think we came out of there feeling pretty good about how we won the game. Napheesa Collier paced the Huskies with a season-high 31 points and 16 rebounds, notching her 13th double-double of the season. The senior scored 10 of those points in the first quarter, serving as a steadying presence amid a frantic and sometimes unsettling start. South Carolina (17-6, 9-1 SEC) sank 10 of its first 11 shots and led 27-23 after one quarter. The Huskies delivered a commanding response, though, outscoring the Gamecocks 29-12 in the third after jumping in front by one at halftime. Considering the opponent (a program two years removed from winning the national championship), Auriemma said the third quarter was the Huskies’ best this season. Guard Katie Lou Samuelson scored 29 points, 14 of which came in the third. Christyn Williams added 19 points, matching the most she’s had since her 28-point outburst at then-No. 1 Notre Dame. Collier gave South Carolina the most fits, though. She was 15-of-23 from the floor, cracking 20 points for the eighth straight game. That proved true again. The Huskies improved to 22-2 (10-0 AAC), notching another marquee win that could prove valuable on Selection Monday. As it is now, the Huskies are no lock to land a No. 1 seed. The first Top-16 “reveal” — which was released Monday at halftime — had them as the No. 2 seed in the Albany (N.Y.) Regional, opposite Mississippi State. Auriemma reiterated that he won’t care where the Huskies are seeded, though. “Wherever they put us, that’s where they put us” he said. “You know how many years people would look at the bracket and say, ‘I hope I’m not in Connecticut’s bracket?’ So, what am I gonna do? Complain about what bracket I’m in? The Huskies aren’t going to worry. After another Top-15 win — they beat Notre Dame and California when they were ranked No. 1 and No. 14, respectively — they feel good about where they stand. Bianca Cuevas-Moore led South Carolina with 25 points. Te’a Cooper, the team’s leading scorer on the season, finished with 20 points despite battling a leg injury throughout the game. Crystal Dangerfield added 10 points and four assists for UConn. UConn will return to American Athletic Conference play Sunday when it visits UCF for a 2 p.m. tip. ODO stepping up: Olivia Nelson-Ododa was the first Husky to check in off the bench, doing so early in the third quarter. The freshman proceeded to play nine quality minutes, recording two rebounds and three blocks. Award watch: Collier, Dangerfield and Samuelson were among the 30 players named to the Naismith Trophy Midseason Team, it was announced Monday. The Huskies were one of three schools with at least three nominees, joining Oregon and Notre Dame, which had five. Dangerfield was also named one of 10 candidates for the Nancy Lieberman Award, which honors the nation’s best point guard.